When people read Kills of the Week posts, they often ask, "Who are these loopy carebears? Who loses ships like these, and how do they respond to being ganked?" Today, we'll meet Kleatus Uta, the Mackinaw pilot who was featured in the most recent KotW. Look at his ship, and try to imagine the sort of fellow he is. Kleatus is probably about what you'd expect. For the first time in two years, Kleatus interacted with his fellow EVE players. He was bewildered by the experience. Kleatus was in luck: He was now on the radar of Agent Ilithyia Borgia, one of the game's most elite PvP'ers. When she's in a good mood, she sells carebears their own loot back. The miner wasn't sure how to behave around other people. If he ever knew, he was rusty. Kleatus had the opportunity of a lifetime: Here he was, face to face with a famous Code enforcement professional. But all he could think about was how he could get back to mining. 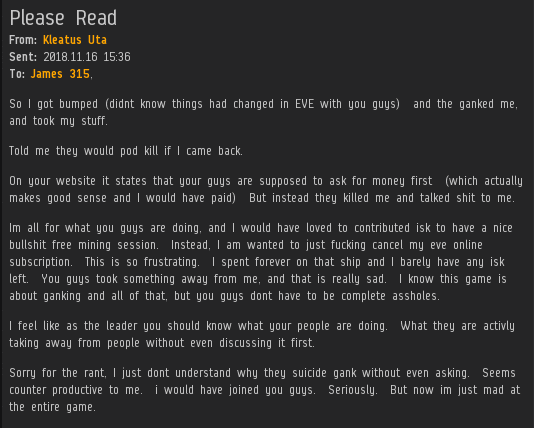 The miner decided he didn't enjoy the company of his fellow EVE players. Nor did he approve of their Code. Reading comprehension--and comprehension in general--were not Kleatus' strong suits. He still didn't understand how mining permits worked. Eventually, however, he discovered that he could send a reimbursement petition to the Saviour of Highsec. The miner was given the chance to buy his equipment back (the stuff that survived, anyway), plus a mining permit. Buying opportunities all around. Kleatus was furious. 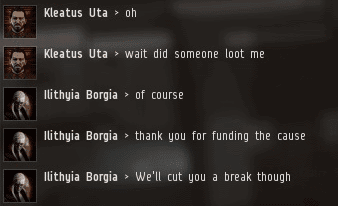 Why weren't people giving him a bunch of free stuff after he'd been ganked in a 1.4 billion isk Mackinaw? The miner came to the conclusion that EVE was only worth playing if he could AFK mine with a blingy exhumer, in highsec, in absolute safety. And he needed his loss fully reimbursed. Then--and only then--would the EVE community be blessed by his continued presence in the game. Fortunately for all concerned, the Kleatuses of the world do not make the rules. That's what the Code is for. 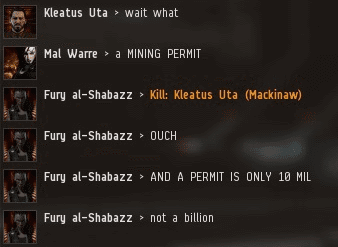 Master negotiator Kleatus offered to buy a permit for 10 million isk if he first received about a billion isk from our Agent. There are two visions for EVE's future. Kleatus has one, Ilithyia has the other. Tell me, dear reader, whose side are you on? It is good to see that our Savior is a Simpsons fan. 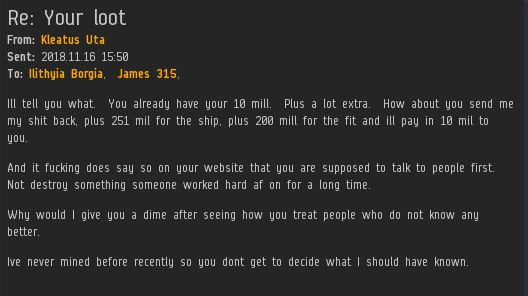 Slackjawed he may be, but he has CODE figured out better than others who were too dumb to see the scam CODE runs and gave 10 million ISK too. Mind you, he shouldn't have been flying what he couldn't afford to replace either. HighSec space is New Order space! Get compliant or get out! How can it be a scam if we sell actual mining permits? 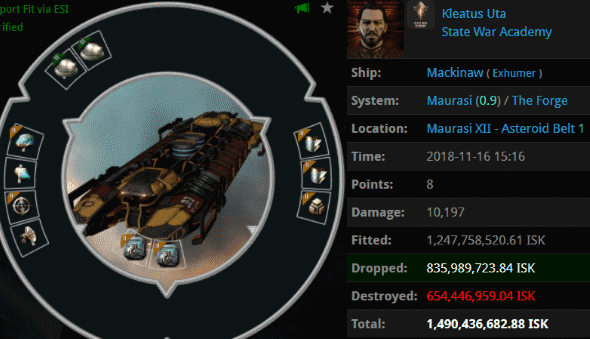 They are literally good for 1 year, and only cost 10 million ISK! Always have. Slack-jawed CHODE. slaves more like it. Where does it say on our website that we have to contact a miner prior to ganking them? Would someone be so kind as to direct me to this rule? No AFK mining allowed. All miners are expected to remain at their keyboards at all times, and are required to prove their presence by responding in local when requested by the Supreme Protector or one of his Agents. I believe they skim the entire Code until they find this clause, and then ignore everything except "when requested" and then use that to infer that the Agent is obligated to make a request. However for careful readers with well-tensioned jaws, that clause in reality only states what the miner must do if requested and places no obligation on the Agent to make such a request in the first place. 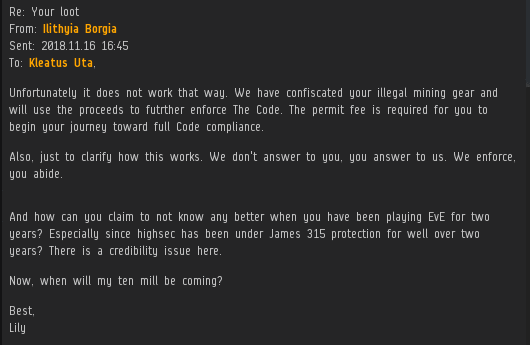 Indeed, I don't bother doing AFK checks for miners who don't already display permits. Unlike in Cleatus' rosy fantasy, miners don't gracefully buy permits and then enjoy a peaceful mining session. They spout profanity and refuse to pay, which is exactly what they do anyway when I gank them. Frankly, if I'm going to be exposed to such ribaldry either way, I'd rather have the win secured to strengthen my case. Thank-you, Lawrence. Another example of how miners are willing to twist the words of The Saviour in order to justify their non-compliance. Interestingly the opposite phenomenon can be observed in more attentive communities - a scout decloaking in the middle of a mining operation will sometimes result in a stampede forming as Skiffs, Hulks and Orcas flee in panic. It's not uncommon for the remaining miners to follow suit, not even knowing what it is they are running from - resulting in a completely empty belt.